How does the saying go? "The road to hell is paved with good intentions." How about this one, "You can't wish your way into heaven." This is equally true of financial goals. A goal is nothing more than a dream until you do something to make it a reality. The plain and simple truth is that you can't wish your way to wealth. You've got to do something about it. And remember, by choosing to do nothing you've made a choice, one that will eventually cost you large sums of money in lost profits. Consider this, if your life continues in the same direction it's going now, where will you be one year from today? Will you be any closer to financial freedom? If you don't like the answer you get then do something to change it. For you to get different financial results in your life, you've got to do something different. Now we all know that the secret to amassing great wealth is to make your money work hard for you, not to have you work hard for your money. And that means you need to consistently build your investments. It really is that simple. Of course simple and easy aren't the same thing. Knowing you need to make your money work for you and actually implementing a plan to do it are two different animals. So let me start you off with some common mistakes people make (and continue to make) throughout their investment lifetimes. 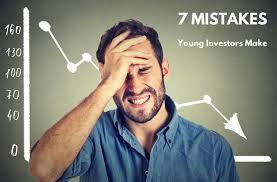 I've listed 7 of the deadliest investing mistakes below. Study them carefully. Memorize them. Avoid them successfully and you will do better than almost everyone else in the stock market. 1. Letting psychological biases and emotions rule your investment decisions. 2. Not having an investment objective. 3. Not having a plan. 4. Not automating your plan. 5. Trying to follow plans that are too difficult, time consuming or impossible. 6. Thinking you're going to get rich quickly in the stock market. 7. Not getting started right away. If you've eliminated these common mistakes, you're on your way to building solid wealth in the stock market. Add a pinch of learning how to correctly assess a stock's fundamentals and a dash of effectively diversifying to lower your risk and you should be laughing all the way to the bank. So don't worry, go out and spend your time pursuing activities you enjoy. Your investments will take care of themselves and then they will eventually take care of you!